The researchers at Legatum Institute, a public policy think-tank, were kind enough to invite me to the launch of their inaugural Africa Prosperity Index several days ago, at their headquarters in Mayfair London. The keynote speakers were Richard Dowden, Director of the Royal African Society and Marieme Jamme, CEO of Spot One Global Solutions and curator of African Gathering. 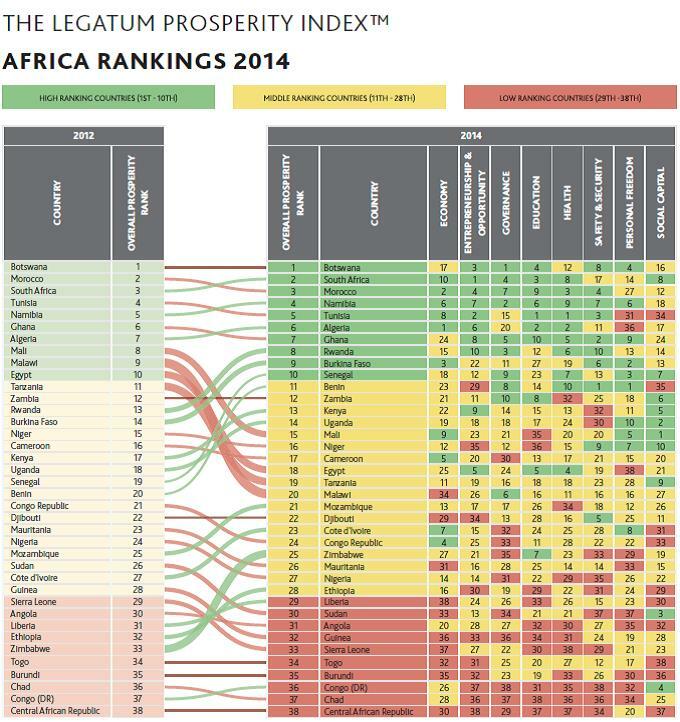 Athough the Legatum Institute has been publishing the Prosperity Index since 2010, this is the first edition with a section devoted to the continent. The Index seeks to provide insights on how prosperity is changing across the world by providing a measure for assessing a population’s well-being that goes beyond just GDP and per capita income. The Index identifies eight indicators or Principles of Prosperity to measure wealth and well-being across countries. These indicators are: Economy, Entrepreneurship and Opportunity, Governance, Education, Health, Personal Freedom and Social Capital. Data for the analysis is derived from sources such as the World Bank’s data bank and Gallup World Poll. According to the report which accompanied the Index, African nations have made progress over the last three years. In particular, Africa is performing well in the Personal Freedom, Economy and Entrepreneurship & Opportunity sub-indices. It notes however that weaknesses persist in the areas of Education, Health, and Safety & Security. Unsurprisingly, the small diamond-rich nation of Botswana takes the top spot, scoring highest in Governance, followed closely by South Africa, the continent’s second largest economy. Central African Republic, a country in the grip of a genocidal Civil War takes the bottom spot, followed closely by Chad. Nigeria’s performance is not so impressive, despite being the continent’s economic powerhouse. It is ranked at 24 out of 38 countries, scoring low points in the Safety and Security indicator. The report also examines in detail three distinct groups of people identified as drivers of African prosperity: the well-educated; female entrepreneurs; and the middle class. A chapter with a country-case study is dedicated to each of these drivers. I liked the two case-study assessments of female entrepreneurship in Egypt and Rwanda. On education, Marieme highlighted the necessity for African countries to focus on policies which promote the STEM (Science, Technology, Engineering and Mathematics) fields in education. In the panel discussion, she mentioned how development partners are providing funds for various other initiatives, STEM fields have not received adequate attention. She highlighted how Rwanda remains the only country so far to successfully implement policies to promote STEM. Generally, the Africa Prosperity Index is a good addition to existing indices such as the UNDP’s Human Development Index (HDI) and the Mo Ibrahim Index of African Governance (IIAG). Its ambitious attempt at empirically assessing well-being beyond income and material wealth is commendable, at a time when several countries like Nigeria, Ghana and Kenya have attained lower middle income status despite the persistence of poverty, weak healthcare and educational systems and in some cases, severe security challenges. The downside in my assessment is that the Index covers only 38 out 54 African countries. That excludes a sizeable chunk of the continent, 16 countries. Although Legatum mentions that it is careful to include only countries for which it has complete data, and that it hopes to increase the range of countries in subsequent reports. Find a copy of the Prosperity Index HERE and the Africa Prosperity Report HERE (PDF). This is awesome. Thanks for sharing and attaching copies. We so desperately need data on African countries and while not perfect, it is a step in the right direction. Great blog.